Cedar Realty Trust is a real estate investment trust that owns and operates grocery-anchored shopping centers through the D.C. to Boston corridor. Over the last five years Cedar had made significant strides in strengthening their balance sheet and creating value for their shareholders. They had also begun shifting their investment strategy; divesting the centers they own in lower-density markets and redeveloping and acquiring assets in high-density urban markets. Cedar partnered with Delucchi Plus to create a brand that reflected their corporate vision and goals for the future. It was clear during our first kick-off with Team Cedar that a compelling brand story existed and they just needed help bringing it to life. Each team member was passionate about the Cedar values and the commitment they share for both their shareholders and the communities they invest in. We helped Cedar craft a messaging platform that spoke to investors about their portfolio and strategy, and also to prospective employees about their rich company culture. Visually we created a brand that was crisp and contemporary. We modified the logo typography to be more streamlined and created a color palette based on vibrant greens with eye-catching accent colors. We also introduced contemporary angles as a brand element – a nod to Cedar’s dedication to growth, and to the shape of the ‘d’ in the Cedar logo. Graphic icons and enlarged, statement typography were used to bring Cedar’s core values and key stats to the forefront. 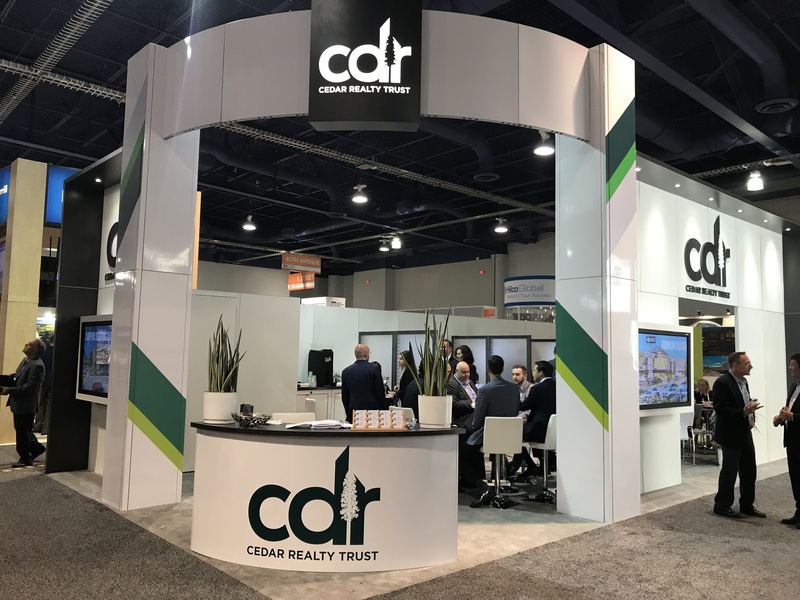 We designed a suite of branded collateral items for Cedar Realty Trust – including a new website and a trade show booth for ICSC ReCON Las Vegas. The intuitive website features bold property photography and opportunities to spotlight specific assets or new redevelopment projects. We also worked with Property Capsule, who host Cedar’s entire portfolio, and S&P who provide real-time NYSE updates for shareholders to ensure that both third-party sites reflected the new Cedar brand. Fresh headshots of the executive team and board members, and a dedicated ‘Human Capital’ page that speaks to Team Cedar and their values further connect Cedar Realty Trust both with prospective employees and to their shareholders. 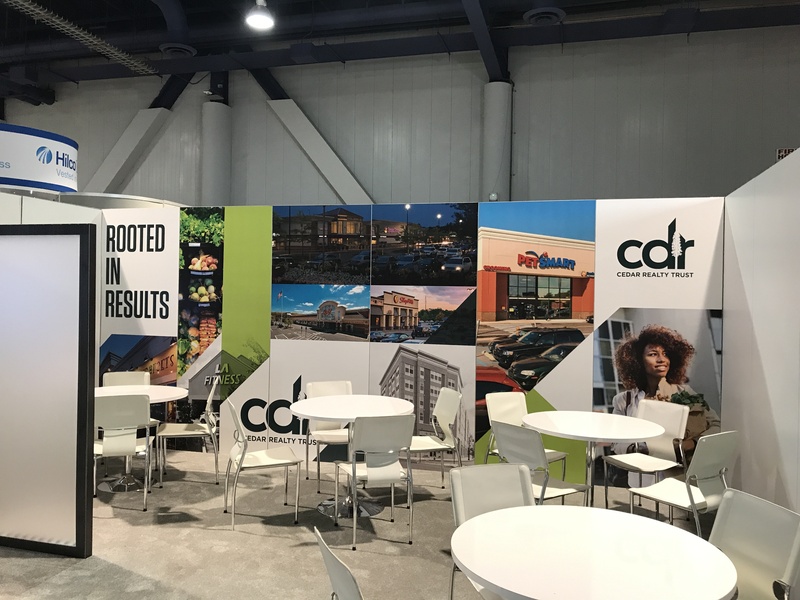 Modern materials with subtle textures were paired with photography and branded graphics to create a modern ICSC booth that was highly visible in the bustling convention center. An animated slideshow featuring photography and renderings of Cedar’s assets along with an overview of their corporate values and strategic vision played across touchscreen TVs. 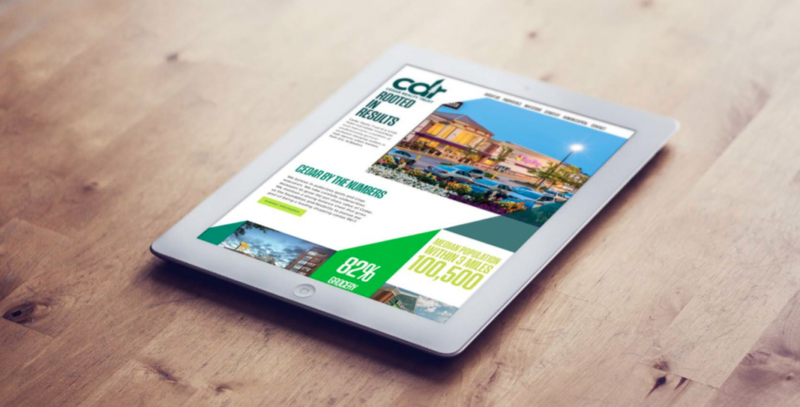 Since launching the new brand, Team Cedar has received positive feedback on both their new website and booth. We’re proud to have collaborated with an innovative NYSE-listed REIT that lives by the mantra ‘doing well by doing good’, and look forward to continuing to partner with Cedar in the future. Our Culture: The Candy Bar Can!